Since returning to the private sector in late 2008, we have not had a case inquiring or requesting GSR testing—until recent months. In one case GSR was completed by the agency as routine protocol, and in two private consultations we demonstrated the unreliability of GSR and recommended more definitive alternative protocols for the cases. With these recent cases, we decided some information was needed. The information below is simplified and not intended to relate any scientific processes or principles beyond some explanation. 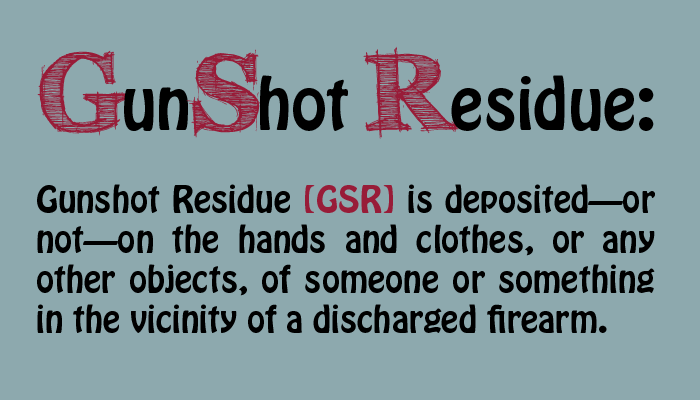 GSR, an acronym for Gunshot Residue, is deposited—or not—on the hands and clothes, or any other objects, of someone or something in the vicinity of a discharged firearm. Special sealed containers with tabs bearing an adhesive substance are used to collect microscopic particles as directed in the kit—hands and face, as well as other areas of concern (i.e. clothing); there is one tab that remains sealed and unused as a control for the laboratory. It is our experience that GSR will not further the quest for answers. 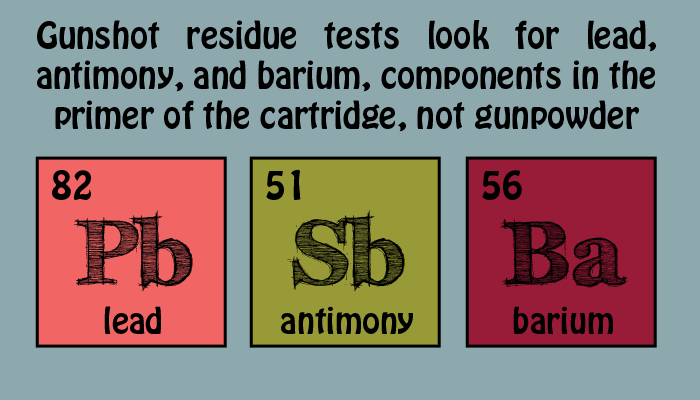 There are only two possibilities to GSR testing, per tab collected and tested: positive and negative. If positive, it only confirms a person being in the vicinity of the discharge, not that they did or did not shoot. Similarly, if negative it is not conclusive they were not in the vicinity of or discharged a firearm. In addition, there is a possibility that the movement of the bodies may have spoliated that evidence. As this is microscopic and multiple areas are collected from, this is a variable that we cannot specifically address. The expected result is that #1—positive for the alleged shooter and negative for the alleged victim. However, this is not conclusive—no more than the remaining simplified possibilities. As an example, in research Karen learned from a recent very notable case in which it was known who the shooter and who the victim was. In this case there was one confirmed particle (lead). Specifically, GSR was found on the shooter’s jacket in the form of 1 particle of lead found on the upper back portion of the right sleeve. No GSR was found on the decedent or his clothing, or on the hands or other areas of the shooter’s person. In the altercation the shooter was on the ground and the decedent was on top of him, in close proximity, and the firearm was a semi-automatic handgun.